The Lightweight Environmental Protection (LEP) is an insulation subsystem developed under the Special Operations Forces Personal Equipment Advanced Requirements (SPEAR). The system is designed to be individually configured based upon mission, terrain and climate requirements as well as personal preference. 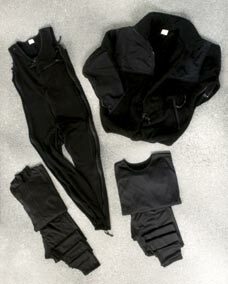 LEP consists of seven garments designed to provide protection to -40°F. The underwear layers are designed to wick away moisture and provide warmth. The bib and fleece jacket are intended to aid the base layer in moisture vapor transmission and providing a significant insulation layer. All layers may be worn individually or simultaneously (except jackets) and will fit comfortably with each other. The four non-wind resistant layers are intended to be worn under a windproof, water repellent outer shell such as the ECWCS Parka and Trousers. The wind resistant jacket is designed to be worn as an outer layer and combines the effectiveness of the heavyweight fleece jacket and a windproof, waterproof outer shell.